How do you feel when you are lifting your child onto a desperately overloaded, leaky, half-deflated rubber raft with a sputtering motor, with everything you had built in the life behind you destroyed forever and the very real possibility that some or all of you may drown in the coming hours? This question came up with my colleague and co-translator, Manar, while reviewing one of the Arabic-language interviews from last month’s shoot in Greece, where our interviewee was describing just such a moment. Refugees from Syria themselves, Manar and her family have faced this moment also. I asked her what she felt as she passed her children across a sea of people into the raft that was supposed to take them from Turkey to Greece – a 12-mile journey that has cost the lives of hundreds of desperate people in the last few years. Manar answered without hesitating, an Arabic phrase that caught me up short then and kept coming back to me in the days after I left Greece and joined my son for a bike ride in Switzerland and France. I’d look at him, pedaling next to me, and think about what I’d have done in Manar’s situation – or that of thousands of other parents who have stood on the same shore and made the same enormous gamble with destiny. I still think about this often. I think about it from the point of view of any parent who has spent years shepherding children along the path to adulthood, protecting them from danger when necessary. I also think about the political dimension. Why have so many thousands of people found themselves forced to cross in dangerous, unseaworthy boats, having paid enormous sums to criminal operations run by smugglers, and often after physical mistreatment and abuse? Why have so many died, so many been injured, so many been left for days drifting at sea? Why were there no ferries – the very same ferries that already exist to transport tourists between the Greek islands and the Turkish mainland? 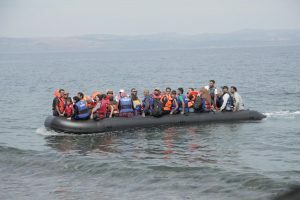 At the height of the crisis, tourists from the US and Europe would often be the ones to spot these refugee rafts from the safety of their deck chairs. It is true that the crisis ramped up very suddenly. Nevertheless, months and now years have passed and no such provisions have been made – why is that? It certainly would not require unusual efforts and vision to put such a policy in place.